WOMEN’S LEADERSHIP CERTIFICATE Overview With an emphasis on leadership and strategy development, the Women’s Leadership Certificate provides participants with the expertise, credibility, and confidence needed to make the most out of their career. 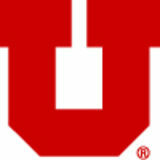 Over the course of six twoday classes, participants will learn through a combination of lecture-based presentations and interactive activities under the guidance of top female faculty from the David Eccles School of Business. Participants will leave the program with a well-rounded knowledge of how to increase productivity, happiness, and efficiency in the workplace. Furthermore, participants will expand their network and form connections with other professional women throughout the program. 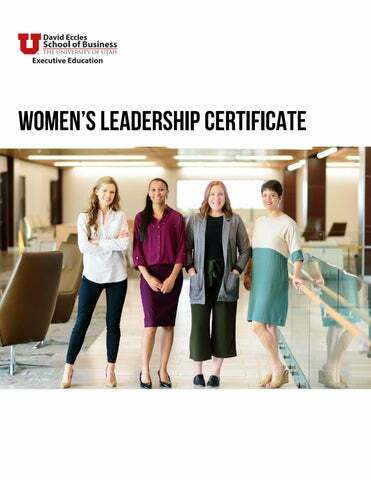 Certificate Requirements The Women’s Leadership Certificate requires the completion of six two-day women’s leadership courses. Topics include change management, leadership, negotiations, teamwork, public speaking, mindfulness, and strategic leadership. Women’s Leadership Courses Completion of any six of the following Women’s Leadership classes is required to earn this certificate. Art of Negotiations Presenting Faculty | Dr. Kristina Diekmann Gain tools and tactics to increase your influence as a negotiator and learn effective strategies for negotiating business deals and resolving disruptions while identifying your strengths and weaknesses as a negotiator. Change Management Presenting Faculty | Bonita Austin, MBA Learn to apply proven change management models and techniques to help your company deliver on the promise of its change initiatives, reduce employee and managerial frustration, and decrease the chance of change initiative failure. Charting Your Path to Strategic Leadership Presenting Faculty | Dr. Patricia Gorman This session explores strategies to become a more effective leader. Focusing on who you are and how you work with others, you will leave this course with the next steps in your path to becoming a strategic leader. Effective Teams and Healthy Conflict Presenting Faculty | Dr. Jennifer Cummings Research has revealed effective and ineffective communication practices for effective teamwork. Learn about them and reach personal and organizational goals while becoming the leader you want to be. Leadership Agility Presenting Faculty | Andrea Thomas, MBA In a rapidly changing world, the key quality needed in leaders is agility. Gain strategies to increase your capacity to anticipate and understand challenges, rally the resources to resolve them, and become a valuable, adaptable leader. Mastering Public Speaking Presenting Faculty | Dr. Kate Cañas As a leader ascends in their organization, they are required to speak in public as they shape the organization’s mission and values. Become a more confident speaker that creates a powerful, emotional audience connection. Mindfulness & Interpersonal Effectiveness Presenting Faculty | Dr. Georgi Rausch This session will hone the interpersonal communication skills and emotional intelligence necessary to become a successful leader.